A food wrap that’s attractive, eco and effective? We’ve found it—Bee’s Wrap. 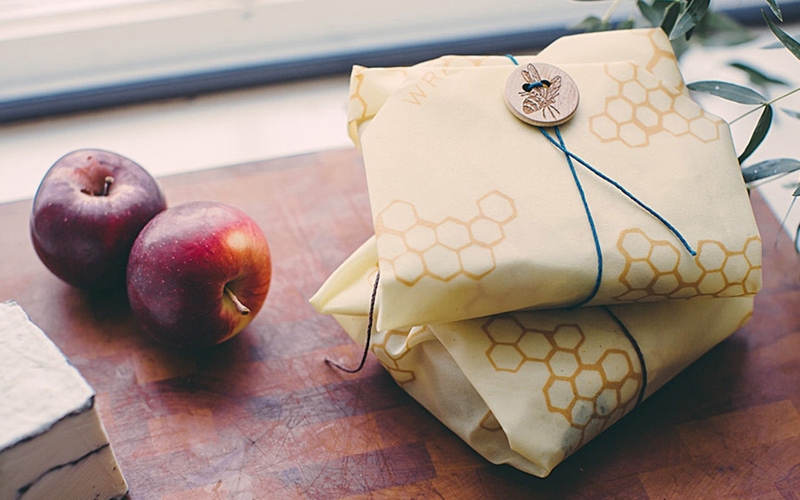 Made of organic cotton muslin that’s coated with beeswax, jojoba oil and tree resin, Bee’s Wrap is a malleable food wrap that can be used again and again. Bee’s Wrap was founded by avid fruit and vegetable gardener (and now beekeeper) Sarah Kaeck. Before her nifty invention, Kaeck tried all sorts of ways to preserve a cut cucumber, apple or leftovers without resorting to plastic wrap and aluminum foil. Her search for a more sustainable solution resulted in the coated fabric. “The process entailed many days of trial and error, my family being my patient testers,” she says. Bee’s Wrap is made from certified organic cotton fabric, beeswax sourced sustainably in the US, tree resin and jojoba oil, which all help to keep the beeswax supple and adhesive. The beeswax and jojoba oils provide antimicrobial benefits as well, Kaeck points out. The magic to making beeswax work is the warmth of your hands, which molds the fabric to whatever you wrap in it, and it then stiffens as it cools. In the company’s early days the Kaeck house was filled with the sweet smell of warm beeswax, but the growing operation recently moved to a workshop in Bristol, Vermont. However, that doesn’t stop Bee’s Wrap from being a family affair. Kaeck brings her youngest daughter to work a couple of days a week. “She is a part of work life here, and of course all our kids contribute their ideas when we are problem-solving something in marketing, production or new design.” As the company grows, Kaeck says she is thrilled to be able to employ locals in healthy surroundings doing work that supports the environment. The company sells Bee’s Wrap in various sizes, including a long, thin strip for baguettes. “The Bread and Baguette Wrap is perfect for keeping bread fresh,” says Kaeck. You can wash Bee’s Wrap with soap and water, and it lasts for about a year. The company will soon be introducing a wrap just for sandwiches, along with new material patterns.